Early concept art of the Three Brothers. The Prime Evils, also known as the Three Brothers, are the rulers of the Burning Hells, and the three most powerful demons in existence. They are the "greater half" of the Great Evils, and in some level of contest or conflict with the Lesser of the Great Evils. The legions of Mephisto are driven by a hatred of all living things - especially those who are pure of heart. He counts as minions both the walking dead, who forever seek vengeance upon the living, as well as a host of demonically corrupted creatures whose twisted limbs and misshapen bodies leave them in eternal agony and rage. The soldiers of Baal seek the undoing of the universe. They strive for ultimate disorder and destruction, and to this end covet the destruction of all they behold. Order is an abhorrence to them and these creatures are the manifestation of the forces of chaos. Using illusion and fear as their greatest weapons, the attendants to Diablo are formidable adversaries. They prefer to wait for their opponent to display a moment of weakness before they attack. Equally dangerous in the dark or in your dreams, they are the fears of man made flesh by Diablo’s will. These nightmares lurk at the edges of mortal perception from the moment that you take your first breath - and they long to be with you when your take your last. 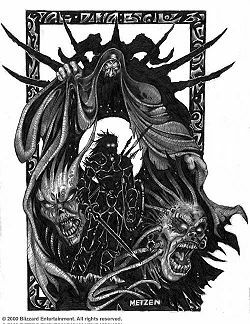 The three were banished to the mortal realm by the Lesser Evils, and were hunted by the Horadrim when physically on Sanctuary. This page was last edited on 31 May 2010, at 23:01.